For those not well versed in matters of international canine security, this video is the end result of a matter that began in May of last year, when Depp and Heard traveled to Australia (new official motto: “Tie Yer Kangaroo Down, Sport, Or We’ll Euthanize It”) and flouted quarantine laws by smuggling in Pistol and Boo without proper permits. Just like when Icarus flew too close to the sun and had his pet chihuahua in one of those under-arm travel cages, both Depp and his terriers came crashing back to Earth when the authorities briefly threatened to put down the felonious dogs, and then—even more absurdly—suggested they might jail Depp, like he wasn’t the star of Transcendence or something. 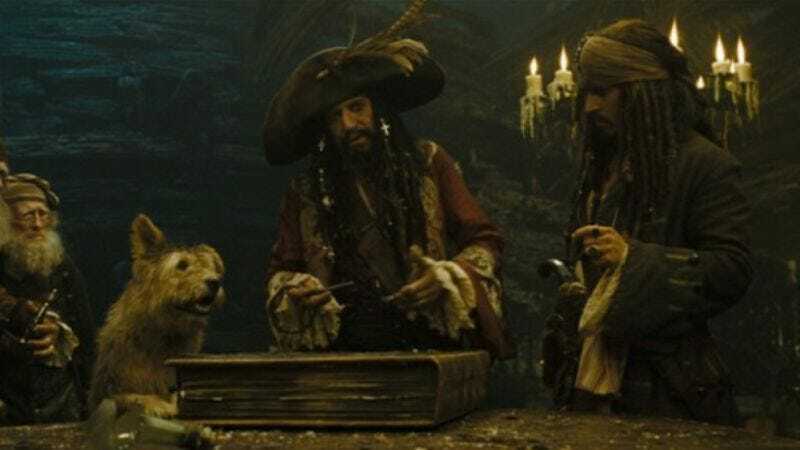 After the Australian government remembered internationally famous film stars don’t ever face consequences for their actions, it turned to Depp’s slightly less famous actor spouse, Heard, and charged her with two counts of illegally importing dogs, one charge for each adorable little furry moppet. And now, after months of legal back-and-forth (and one ill-considered joke from Depp), the matter has been resolved. ABC News reports Heard appeared in court yesterday, Depp by her side, to plead guilty to one count of falsifying documents in exchange for the illegal importation charges being dropped. In addition to a fine of A$1,000 (or roughly the cost of one of Pistol and Boo’s trips to the dog groomer), the couple recorded the above video apology, in which the two actors display all the ease and on-camera charisma of rapidly congealing breakfast burritos. Heard repeatedly turns to look at Depp after saying her lines, presumably to confirm they were uttered correctly, and authorities didn’t trigger the tiny explosive device planted in Depp’s head to ensure compliance. “Australians are just as unique, both warm and direct. When you disrespect Australian law, they will tell you firmly,” Depp intones, in a masterful display of how being spoken to firmly does not concern the hero of What’s Eating Gilbert Grape? This makes for a surreal end to the ordeal, though one that happily lives in perpetuity online, where we can someday show our grandchildren the true cost of being an actor caught smuggling dogs into Australia: Giving a laughably unbelievable performance.